The Penguin is a helicopter launched anti-ship missile developed for use on Lamps III helicopters and NATO allies. Penguin is the only operational Navy helicopter-launched missile in the Navy's weapon inventory. It provides Navy surface combatants with a defense against surface threats armed with antiship missiles. 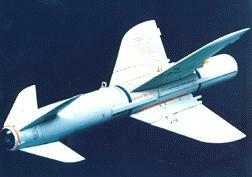 The PENGUIN missile is a short-to-medium range inertially guided missile with infrared (IR) terminal homing. The missile consists of a seeker, navigation and control section, warhead,rocket motor, four folding wings and four canards. It is capable of gravity drop launches at low speeds and altitudes. Ships and surfaced submarines are the missiles primary targets. A principal operational advantage of Penguin is its relatively long operational range, which permits a helicopter armed with Penguin to remain outside the launch envelopes of potential targets. The Penguin missile has an indirect flight path to target. It is also operated in "fire-and-forget" mode to allow multiple target aqusition. The Penguin is fired from a launcher or a stage weighing approximately 1100 pounds (500 kilograms). The Penguin is a uniquely capable weapon against small combatants and surfaced submarines in the littoral environment. The IR seeker head is effective against a wide range of targets and its profile is hard to defend against. It is a short-to-medium range inertially guided missile and is capable of gravity drop launches at low speeds and altitudes. A "fire-and-forget" missile, the Penguin has a 360 degree arc, autonomous search, acquisition and track during terminal phase, discriminates between target decoys and is resistant to IR countermeasures. The PENGUIN weapon system consist of the AGM-119B guided missile, Missile Launcher Assembly (MLA), and Missile Control System (MCS). The MLA contains the MCS and attaches to the pylons of the SH-60B LAMPS MKIII Helicopter and provides mechanical attachment points for missile launch/release system a (BRU-14 bomb rack with two AERO-1A adapters). The MLA, with BRU-14 attached, carries and launches the PENGUIN on command. The MCS is an integral part of the MLA. The MCS is located in the MLA and provides the interface between the helicopter and the missile for control, transfer of data, and electrical power during captive flight. The MCS contains the alignment unit,missile power unit, alignment power unit, umbilical release unit, and umbilical and interconnecting cables. Penguin is a fully digitized missile with canard control. The high resolution, passive infrared seeker provides a high degree of discrimination and target selection, and ensures efficient operation in confined, as well as open waters. The high accuracy, inertial navigation system ensures the missile's capability of target detection, and provides the flexibility of mid-course trajectory via pilot-designated way-point. An efficient 120 kg warhead, with an impact point close to the target's waterline, will inflict serious damage to medium size surface combatants or other targets. The missile is powered by a solid propellant two stage rocket motor. The Penguin can be adapted to helicopters, fixed wing patrol aircraft as well as fighter aircraft. The missile system is software integrated into the aircraft avionic system. with the use of existing equipment for suspension, control and operation. The PENGUIN missile is a helicopter launched version of the Norwegian MK 2 MOD 3 missile which has been modified and designated as an MK 2 MOD 7. The Penguin was developed by and for the Norwegian Navy. The Penguin missiles are designed and manufactured by Norsk Forsvarsteknologi (NFT) A/S located in Kongsberg, Norway. The Penguin anti-ship missile was conceived in the early 1960's as a ship-borne, anti-invasion defence system. Penguin was the first fire-and-forget anti-ship missile system to be developed in the Western world. Penguin MKI became operational with the Norwegian and Turkish navies in 1972. The MK2 entered service in 1980 with the Norwegian, Hellenic and Swedish navies. Since then, continuous development programs have adapted the concept to the technical evolution of surface warfare. The air-launched penguin MK3 version (AGM-119A) was chosen as the standard anti-ship missile for the F-16 Fighting Falcons of the Royal Norwegian Air Force. and has completed a highly successful Foreign Weapon Evaluation Program conducted by the US Air Force. Navy testing of Penguin has been completed, and it achieved IOC in the fourth quarter of FY 1993. The successful first fleet firing of an AGM-119 Penguin anti-ship missile by the HSL-51/USS HEWITT (DD-966) team on June 25, 1994, completed the transition of the SH-60B "Seahawk" from an anti-ship surveillance and targeting (ASST) platform to an anti-surface (ASUW) weapon system. The initial operating capability (IOC) was completed at the Pacific Missile Range Facility (PMRF) Barking Sands, Hawaii during RIMPAC '94 with the INDEPENDENCE Battle Group. The direct hit by the telemetry round against the YOG-79 target hulk resulted in the ninth successful Penguin launch by the U.S. Navy. The first eight were completed in 1990 during Techeval/Opeval by Rotary Wing Test Directorate and VX-1. The Navy will acquire approximately 100 Mod 3 versions. The Penguin MK2 MOD7 (AGM-119B) with folding wings is adapted to the US Navy LAMPS Mk III, SH-60B helicopters. All Block I modified SH-60Bs will be capable of employing Penguin, and eventually all SH-60Bs operating from US Navy FFG-7 and DD-963 Class Ships. The National Defense Authorization Act for Fiscal Year 1997 contained a provision that authorized the Navy to enter into a contract for multiyear procurement of not more than 106 Penguin missiles and limited the amount that could be expended for such procurement to $84.8 million. This provision was based on the existing shortfall in Penguin missile inventory and the premise that the Navy would be able to negotiate a very favorable price at around 55 percent of the average unit procurement cost for previous lots. Congress subsequently appropriated $7.0 million to procure Penguin missiles in fiscal year 1997 and $7.5 million in fiscal year 1998.